Jamie Moore believes that Josh Warrington will struggle to reproduce his performance when he took Lee Selby’s IBF World Featherweight title in May. Warrington upset the Welshman and he is now the underdog again ahead of his first defence against Frampton on December 22. “I think Lee Selby was probably his big night - I’ve got to be honest,” said Moore. Moore is an admirer of Warrington, but when he breaks down their clash that many believe will be Fight of the Year he insists there is only one winner and doesn’t expect a 12 round distance contest. “His jab, his judgement of range and distance. “You can’t just go in there and out work someone who has got the skill set of Carl. “His feet are nice. He has got an unorthodox defence so he’s not a typical hands up, fast feet boxer. “He dips, rolls and slides and has an odd rhythm. 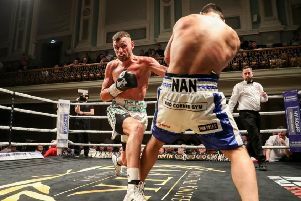 Also on the bill Mark Heffron and Liam Williams contest the vacant British middleweight title and Belfast’s Michael Conlan takes on former commonwealth champion Jason Cunningham. In a step up, Nathan Gorman puts his undefeated record and WBC International Silver Heavyweight Title on the line against former World Title challenger Alex Leapai, while Martin Murray defends his WBC Silver middleweight title against Hassan N’Dam. Elsewhere on the bill. World flyweight title challenger Paddy Barnes and unbeaten Steven Ward return to action.